DO YOU LIKE SKELETONS? DO YOU LIKE FUZZ?! New HIGH/LOW mini album ‘Skeletons’ – Out 27 July 2018.
and get immediate download of bonus track ‘All Lofi’! 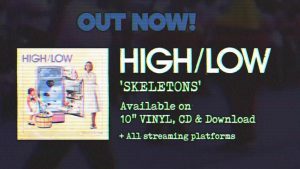 ← HIGH/LOW – Do you like SKELETONS? Winter EP - OUT NOW!